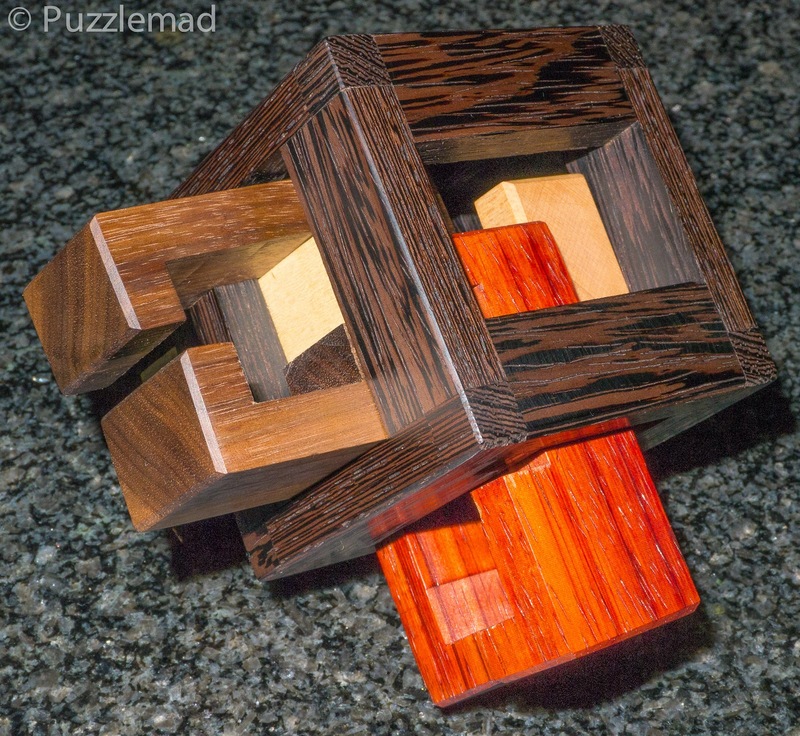 PuzzleMad: A Burr so Tough it had to be Caged! Trichromat by Yavuz Demirrhan - Stunning! Quite some time ago I was completely enthralled by the stunning caged burr series designed by Logan Kleinwaks and beautifully made by Eric Fuller - I reviewed them here in an article extolling the virtues of 6 piece burrs "with a difference". I have always loved the burr puzzles but ever since obtaining and solving that series, I have been especially interested in burrs that have something extra to make them interesting like these. Not long ago I wrote about some burrs from Alfons that, apart from having unusual numbers of pieces, also have other pieces inside (usually animal figures) which interfere with the solution. Most recently I played with Gobi (still available for sale) designed by Alfons and made by Eric again. 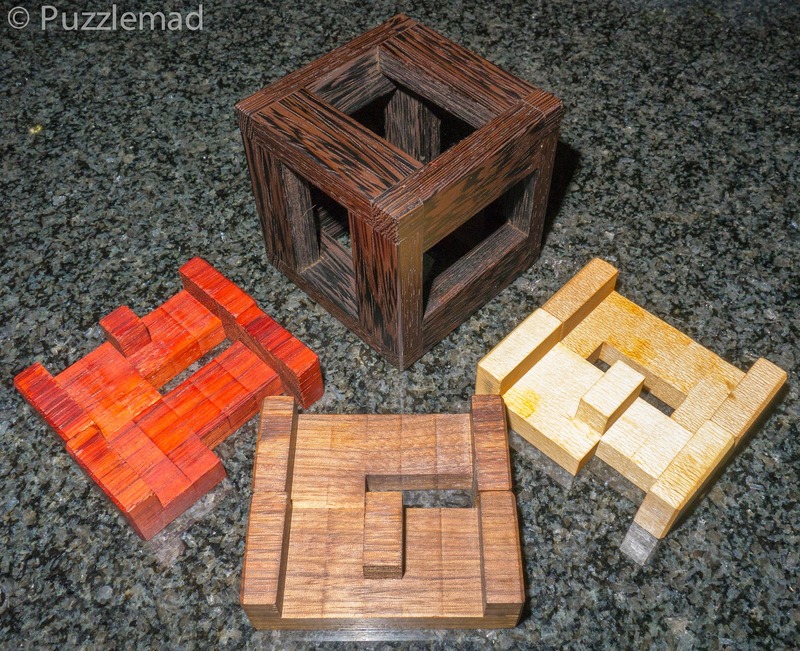 It was so good that it was mentioned in my best of 2014 puzzles list. So adding constraints or adding extra internal blocking pieces to burrs of various sizes really make them more interesting for me. 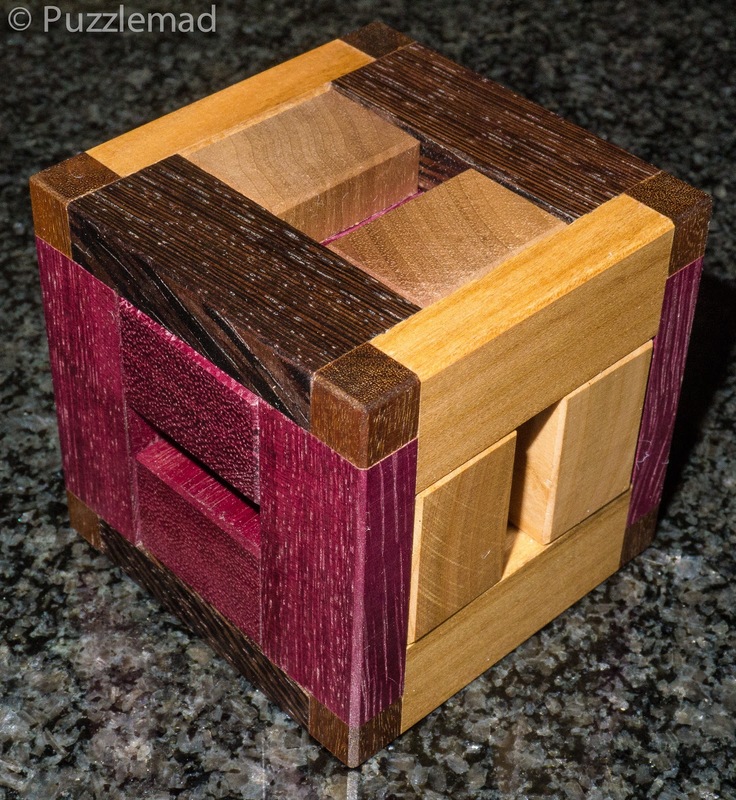 Another feature of some of the more interesting puzzles that have intrigued me has been the return to a 6 piece burr but one in which the burr pieces don't interlock properly instead they are held together by the addition of a cage around the outside. The picture at the top is the Trichromat burr designed by the incredibly talented puzzle designer from Turkey, Yavuz Demirrhan. 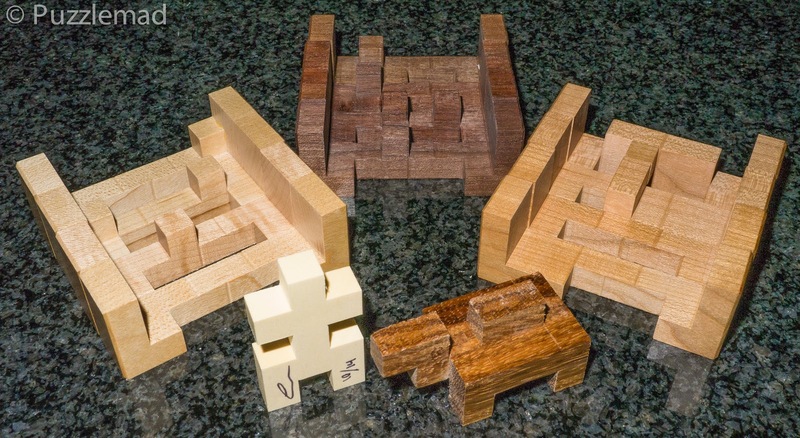 What you may not know, is that Yavuz is also an entirely self taught but highly skilled puzzle maker. I receive regular (several a week) Facebook updates from Yavuz about his new designs usually in the form of screenshots of Burrtools creations or just diagrams but a couple of months ago I was astonished to see a gorgeous wooden thing rather than a diagram! After a short exchange of FB messages it was on its way to me - and I must say for a very reasonable price! 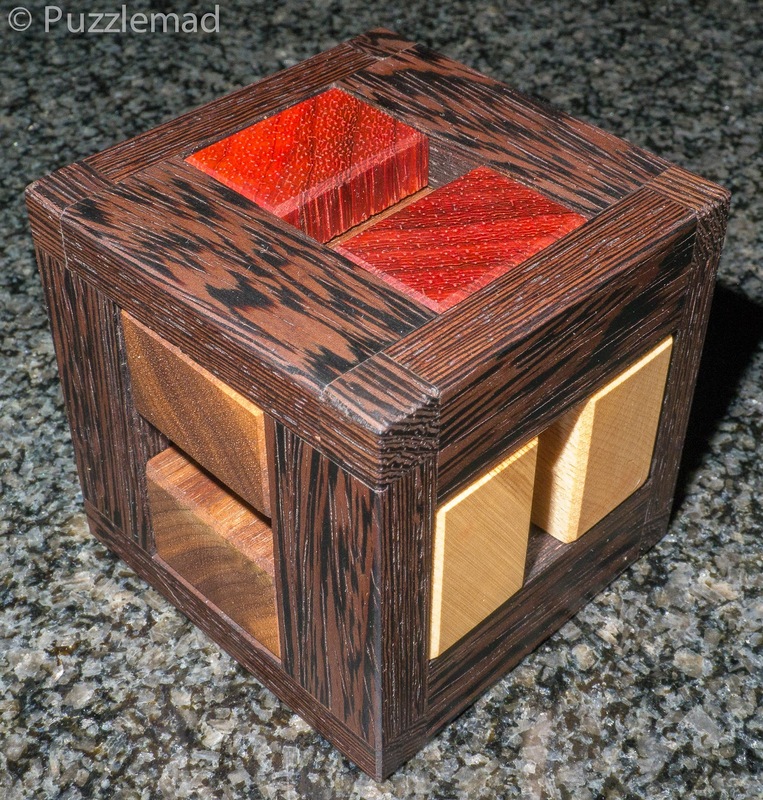 The Trichromat puzzle is made of Wenge, Padauk, Walnut and Maple and looks stunning! Interestingly it is waxed rather than lacquered (European craftsmen seem to prefer wax or oil) and it smells absolutely wonderful! 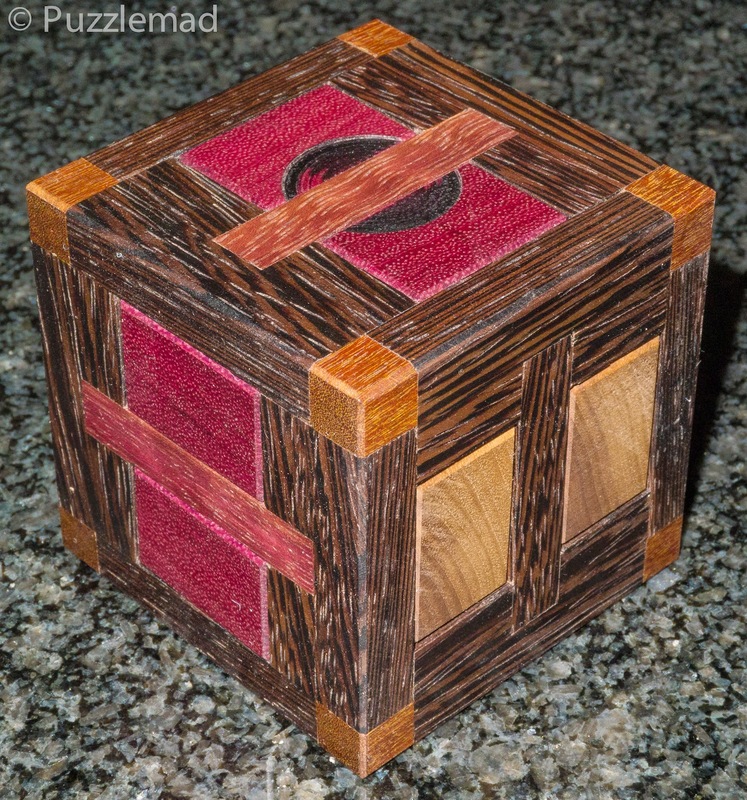 Looking at it reveals that it is nothing more than a burr with 6 non-interlocking pieces held in a cage BUT the quoted difficulty level is 44.1.3.1.2.2. which means that it is a significant challenge. One of my earlier attempts at solving this sort of design was the Neighbourhood by Stephan Baumegger - it looks very similar in shape and is a similarly constrained 6 piece burr but has an easier level of "just"(!!!) 29.2.2.2.2.2 moves. I played with and managed to solve the Neighbourhood in just a single evening of fun! So I thought I'd just follow it straight away with Stephan's next creation, the Rush hour (level 47.1.3.2.2) but after months of on and off trying I have singularly failed! It is currently in my bag with me undergoing a 6th attempt at solution! 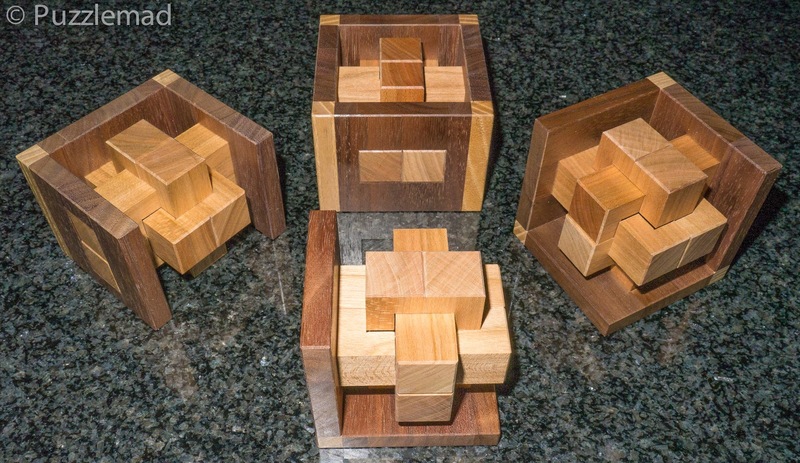 So, having solved one caged 6 piece burr easily and failed dismally at another, it was with some trepidation that I attempted the puzzle from Yavuz. I had a quick play initially when it arrived and I got frightened off by a really complex multi-piece move that I found. I put it away for a while. But after a recent conversation with Yavuz I decided it was time to try again and hopefully not be humiliated again! Almost there? Surely one piece will just slip out? But alas, this position was as far as I got. Every single piece was blocked from advancing - I could only backtrack. Back and forth, back and forth, for a couple of days and each time trying something new or maybe repeating something old ands not realising it! Remember, I'm really not very bright! Then on Thursday night I was idly fiddling again whilst watch TV with Mrs S, when a piece dropped onto the cat's head on my lap! Aaaaaargh! I had no idea how it came out and had also no idea which way round it had been! So I couldn't even put it back in and try backtracking! The remaining pieces came out pretty easily and I was forced (happily) to make a Burrtools file for reassembly. There appear to be 6 assemblies possible but using the colour constraints there is only one with the level 44 for the first piece. Having gotten it back together using Burrtools, I started again and luckily something from my random meandering must have penetrated my dull brain! After another hour of play - and this time it was proper exploration, taking note of the piece shapes and the movements/blockages, I had it apart again. Trichromat pieces - notice how simple they are! 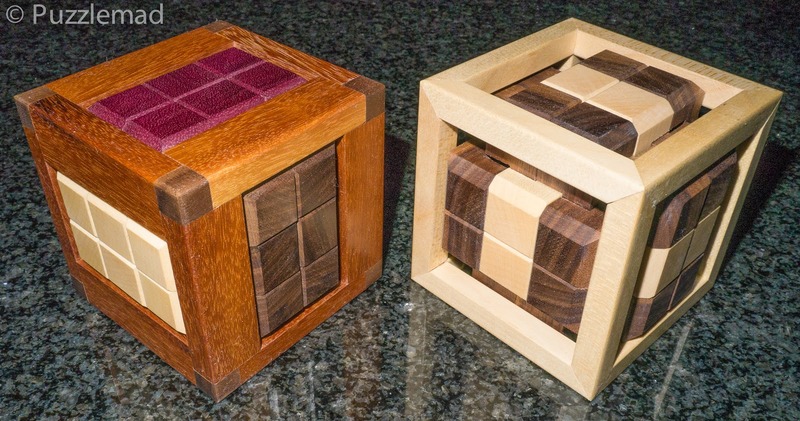 This time I found that I was able to reassemble it from just pieces using memory alone (I had needed Burrtools first because it disassembled by accident) and since that initial solve I have assembled and disassembled it 20 or 30 times - it is fun to wander back and forth admiring the design and smelling the lovely wood aroma. I doubt whether I could assemble it from pieces without having first disassembled it but I know that some geniuses out there insist on starting with a disassembled puzzle. I leave that sort of crazy behaviour to Laurie Brokenshire, Goetz Schwandtner and Adin Townsend. Now it's time to get back to Rush hour and maybe then I might attempt the fabulously beautiful but even tougher Centauri and Odin from Stephan! These are much more difficult - they are classic 18 piece burrs which are constrained by a cage - I actually doubt whether I will ever be skilled enough but at least they look gorgeous on display! Centauri (level 13.141.34.8.17.2.10) and Odin (level 20.10.42.10.3) - GULP! Also in the future I should get some of a really interesting series of burrs designed recently by Alfons in which the cage itself is in pieces, mobile and dismantles along with the rest of the puzzle. I do have just one now - I posted on my New Additions page about a new burr which Alfons named after me! This one has 4 walls around it which interlock and move and will dismantle with the burr. With a nod to the title of my post - there are so many burrs that are tough enough to require a cage! I need more spare time and more money!!!! Remember that you can buy the Trichromat now from Yavuz for a very reasonable price - you won't be disappointed!! See everyone! People even agree with me!! That really amazes me! Of course you are right George! My post title was very much "tongue in cheek". I have definitely become progressively more unhinged as I work my way through these puzzles! Q: Where does the puzzler safely store his ice cream? A: Nested inside a pile of burrs! Can't wait for that centauri blog post! I'm waiting on Andante and Burrner to come in the mail from Stephan and plan on ordering Centauri next! I think you might be waiting a very long time! I can't seem to get anywhere with it. So much so that I have more or less given up and use it for decoration on the shelf!